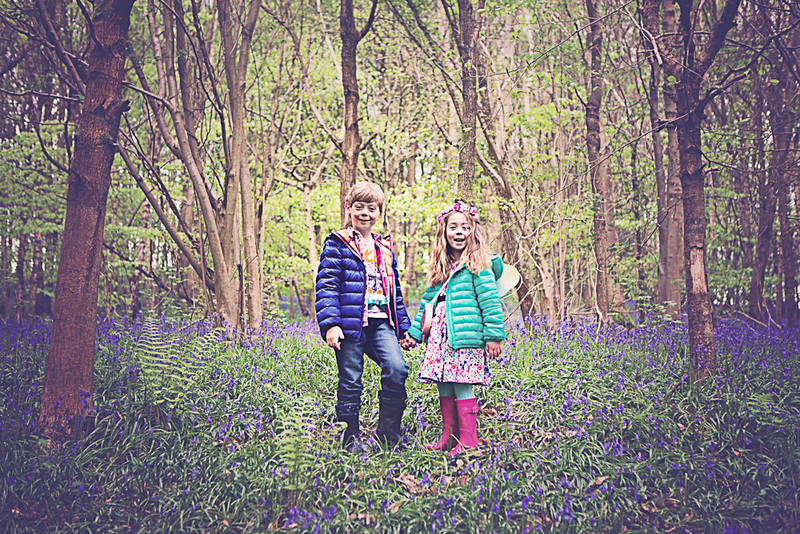 My recent family portrait session was taken in Shadwell woods in Rusthall. The bluebells were in full bloom and the location was a firm family favourite as a walking spot. Only a stone’s throw from their house and perfect for exploring. Their little boy had brought with him all his exploring tools, a compass, binoculars and a magnifying glass. Together we spotted different types of trees and birds. Their daughter, 5 brought her favorite Strawberry bag and wore her favourite party dress. At first she was a little shy, soon she was asking me to take pictures of her with her mum or dad. The day couldn’t have been more idyllic. We needed to walk through a field and to our surprise the normally empty field was full of beautiful horses. This included one absolutely gorgeous horse and her foul. As we strolled through quietly, some of the horses came up to us to say hello. They followed us and were determined to be included in a few photos. The day was so unique and lovely that I have a hard time picking a photo from our day, in the end I chose this one. I loved meeting this family and look forward to showing them the final selection. Its always interesting to see where they decide to hang their favourites. Their home was so beautiful, one of their reasons for booking a photo session with me, was to have something special to hang in the main living room. I hope my images come to remind them in years of a special time and the place. If you are thinking of booking a family portrait session for this Summer or Autumn please do not hesitate to get in touch to find out more. On 07540 090 242 or emailing me at mimi@mimivp.com. Looking forward to some gorgeous weather in the months to come.